Henry Turner Munns (H. T. Munns) was born in Northampton, England, and active in both Birmingham and London. Munns specialized in portraits and genre subjects. While still a schoolboy, Munns had cultivated a talent for portraiture; however, his father discouraged him from pursuing a career as a painter. As soon as Munns finished school, he was employed at the factory where his father was employed as a boot and shoe designer. Determined to pursue his passion, the younger Munns began painting lessons with a traveling miniature painter named Locke. At the age of eighteen, he began receiving small commissions for portraits. After his apprenticeship, he started a portrait club and was able to make a living as a portrait painter. He eventually he moved his portrait painting business from Northampton to Buckinghamshire. When the Russian War broke out, he painted and exhibited a Panorama of the War. His popularity grew when he was invited to lecture about the painting. He then joined a Northampton photographer, and for many years he colored his photographs. He continued this work in Birmingham, this time employed by Mr. Whitlock of New Street. His first portrait in Birmingham was of Dr. Langford, which was exhibited at the Royal Society of Artists. He was eventually invited to become a member of the Royal Society of Artists, and succeeded Mr W. T. Roden as director of the Life Academy. In 1871, he painted the portrait of the Lord Mayor of London, which led to other important civic commissions. Munns exhibited 8 works at the Royal Academy. 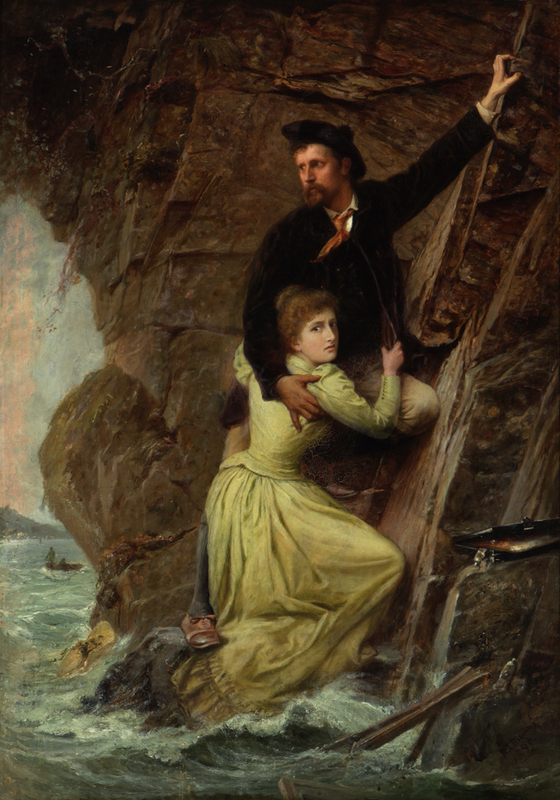 Help on the Way depicts the artist rescuing his model from the surging tide, as they nervously wait for a rescue boat.